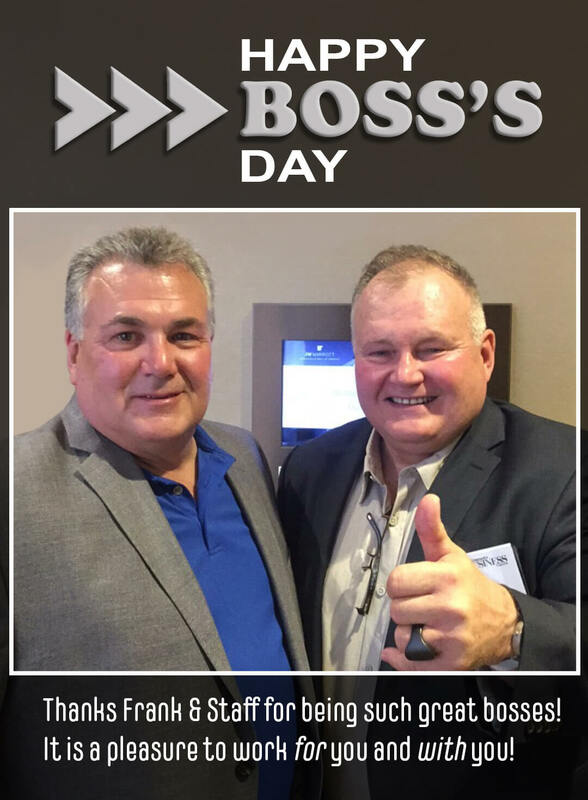 Happy Boss’s Day Stafford and Frank Sterner! 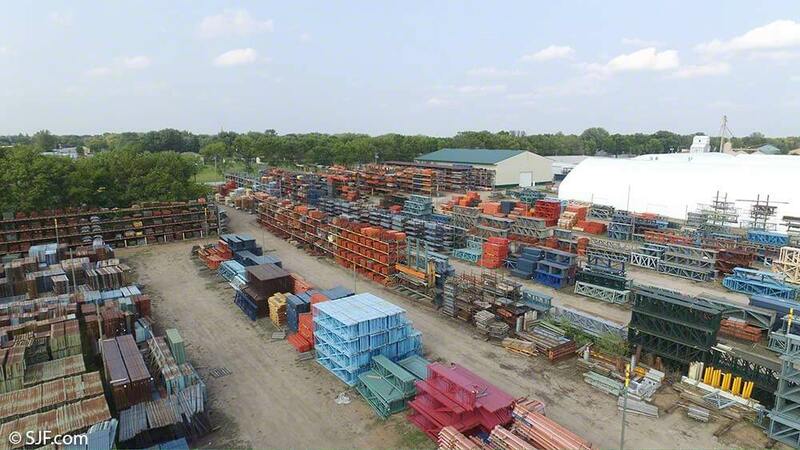 Check out our overhead views of the SJF Material Handling Winsted, Minnesota location – the nation’s largest stocking distributor of new & used material handling equipment. 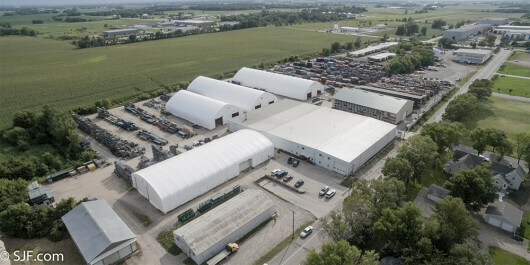 Also, please take a minute to check out our virtual tour, that takes you through our facility and yard. The Sterner family, along with the SJF Material Handling family, are deeply saddened to inform our clients, friends and partners of the passing of our founder, Gerald “Jerry” Sterner on Wednesday, January 10th at the age of 87. He passed shortly after being diagnosed with pancreatic cancer. Jerry opened the business in 1979 as SJ&F Enterprises and was a very active participant in every facet of the business until his retirement, where he turned the reigns full-time over to his sons. He was a huge sports fan and especially enjoyed watching the Minnesota Timberwolves. He was an avid hunter and fisherman and was active in many community organizations prior to health problems. He also enjoyed extensive traveling all over the world with his wife Veronica, including The Holy Land. Jerry was an excellent businessman and was generous and highly respected by his employees. 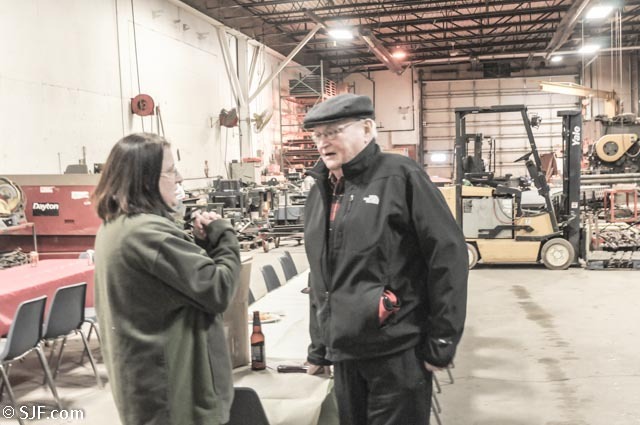 There are many, many stories of his adventures still being shared at SJF, from driving misadventures to rolling up his sleeves and working right along with the employees. He will be greatly missed! Memorial Mass of Christian Burial will be held Monday, January 15, 2018, 11:00 AM at St. Victoria Catholic Church, 8228 Victoria Drive, Victoria, with Father Robert White presiding. The family will receive friends 10 – 11 AM at the church. The internment will be held at a later date at Holy Trinity Catholic Cemetery, Winsted. 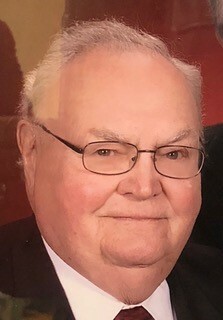 Gerald “Jerry” Joseph Sterner, age 87, of Victoria, MN, formerly of Winsted, MN, died Wednesday, January 10, 2018 at Waconia Good Samaritan Society, Waconia, MN. Jerry was born October 23, 1930 in New Germany, MN, to Frank and Anna (Schmidt) Sterner, one of 6 children. He graduated from Waconia High School in 1948. On June 20, 1953 he married Veronica Mallak at St. Adalbert’s Catholic Church in Silver Lake, MN. They had five sons, two which they lost in infancy. 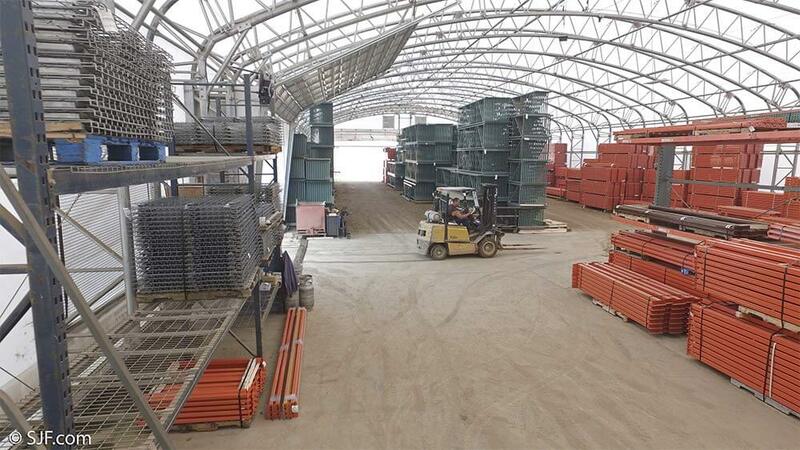 Jerry was proprietor of Sterner Lighting, Sterner Industries, and SJF Material Handling of Winsted, MN. He was a resident of Winsted before moving to Victoria, MN. Jerry was a member the Knights of Columbus, the Catholic Order of Foresters, Winsted American Legion, and St. Victoria Catholic Church. His catholic faith was very important to him. He always wanted his family to work together. 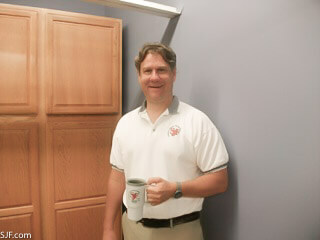 He enjoyed sports, golf, fishing, hunting and being with family and friends. He was preceded in death by his infant sons, Gerald and Jerome, parents, and brothers, Leander and Joe. Survivors include his loving wife, Veronica; sons, Stafford (Diane) of Bloomington, James (Paula) of Waconia, Frank (Paula) of Waconia; 7 grandchildren, Megan (Shaun) Boll, Caitlin (Ryan) Kiskis, Sam (Kelli) Sterner, Nicholas, Josh and Jesse Sterner, Scarlett (Logan) Barnes; 4 great grandchildren, Parker, Isla, William and Jack; sisters, Marie, Janet and Diane; other relatives and friends. 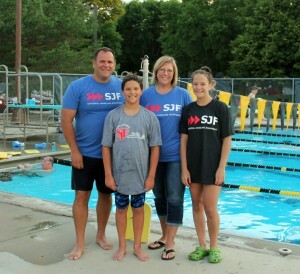 Thovson and family shown here sporting SJF colors were out in force this past month supporting High Tides Swim Club and the USA Swimming Foundation. The purpose of the event was to raise some donations via the Swim-a-thon challenge. Eric’s daughter Bella completed an impressive 240 laps in 1 hour and 53 minutes for a total of 6,000 meters (almost 4 miles). Pretty awesome Bella! Eric swam a total of 1,800 meters adding to the total. 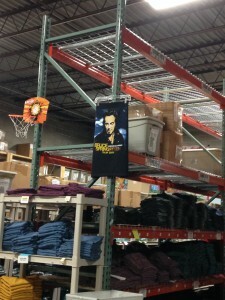 Eric & Bella’s effort helped rack up some additional donation dollars for the event. 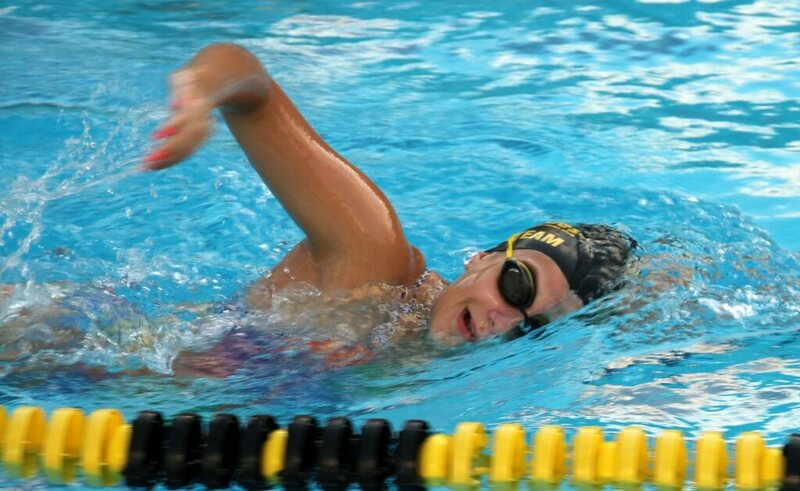 The event saw over 56 athletes ranging in age from 7 to 48 years old participate in this event in support of our non-profit organization dedicated to providing developmental and competitive swimming opportunities to children in the greater Hutchinson area. USA Swimming clubs have over 12,000 registered athletes aged 18 and under in Minnesota and it is the single largest organized activity for kids in the United States. This event raised over $10,000 thanks to the support and generosity of it’s sponsors. 95% of the money raised stays with our local club to help fund our scholarship program for swimmers with financial hardships. The other 5% goes to the USA Swimming Foundation to support national initiatives. 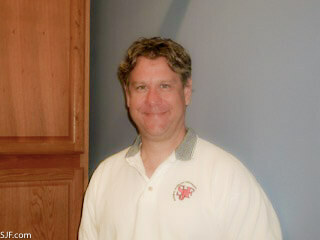 Eric’s involvement in swimming had been as a Dad and President of the Board of Directors until recently. 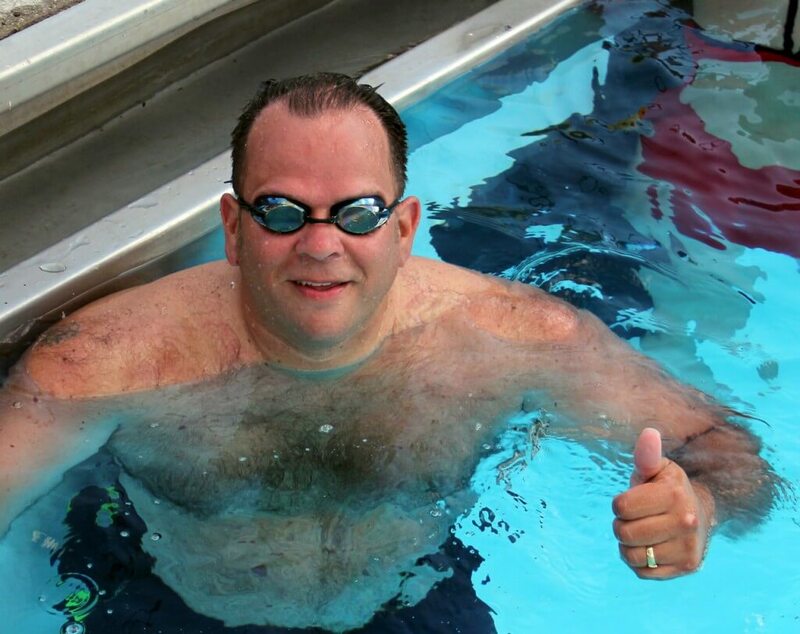 Eric is now back in the water as an official member of United States Masters Swimming. For now it is fitness driven, but at some point Erick claims he may get up the courage to race in a Master’s meet. Maybe about 30-40 pounds from now. One thing is for sure, the Sales team at SJF will surely taunt him relentlessly in his quest. Keep an eye open in the months ahead for further updates. Till then, keep your head above water Eric and keep strok’en. 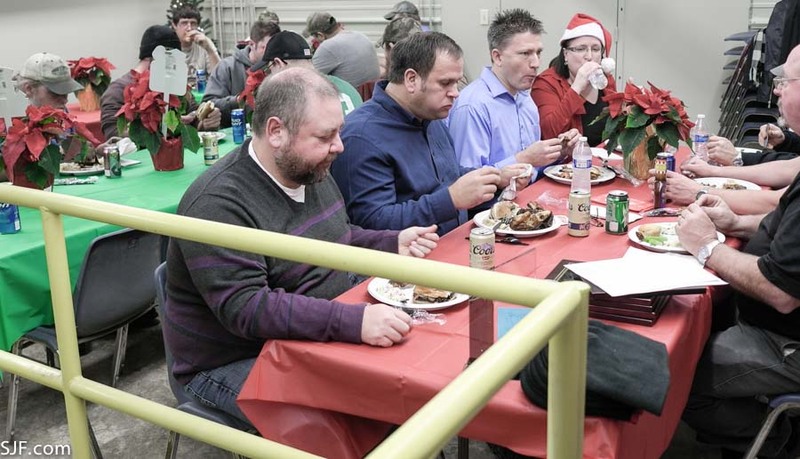 This past Friday, SJF held its annual Christmas day celebration and employee appreciation dinner. 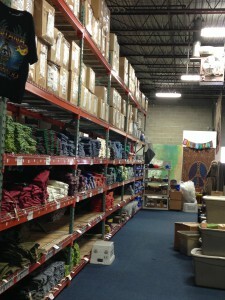 Each year SJF’s owners take time to reflect upon the past years activities with its employees. 2014 was a year which saw several salespeople hitting personal milestone marks. 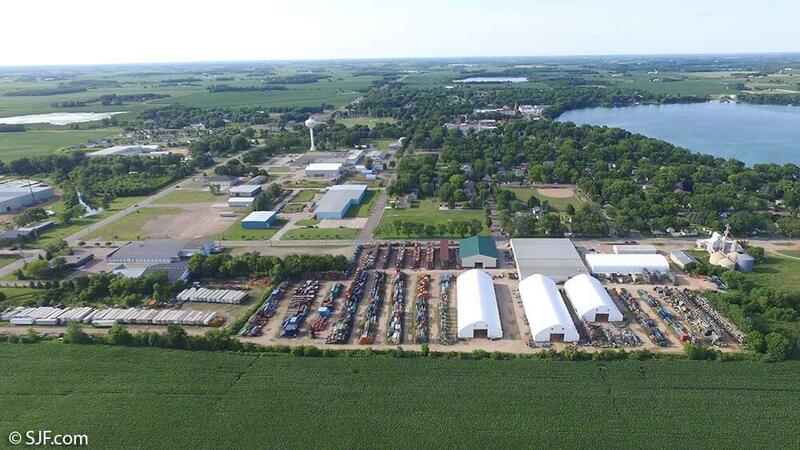 Jason Dieter and Vance Haugen were recognized as 2014 million dollar+ club members, hitting impressive personal yearly sales numbers along with teammates Kendal Kalamaha & Eric Moen, each surpassing 2 million+ sales marks respectfully. As for Kendal & Eric, neither are strangers to sales excellence. Kendal was last years overall SJF sales champion while Eric Moen has put up impressive numbers each and every month throughout the year. In the end, the claim for overall sales title went down to the wire with Eric’s final tally being just enough to edge out Kendal Kalamaha (the 2103 champ) for the 2014 sales crown. Competition among SJF’s sales people is always fierce but friendly. The one thing they all agree on is without the help and support from the many people within the organization, what they do in sales would not be possible. 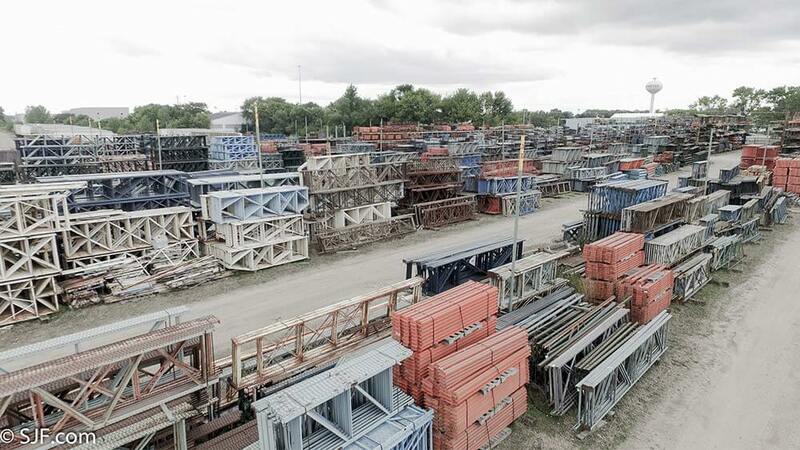 Our shop, yard and shipping folks are truly the life blood of the company and the unsung hero’s that make it all happen for our clients each and every day. Other award winners included Joe Bachel. 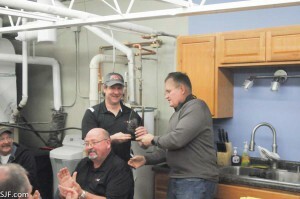 Joe was awarded a special plaque in recognition for an impressive 20 years of service. 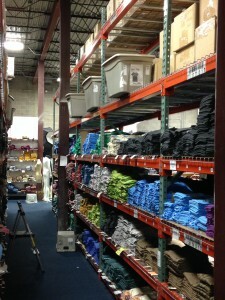 Joe has single handedly kept SJF’s equipment running each and every day for the past 2 decades. His coordination & management of the outside crews is instrumental in getting equipment in and out of the yard on a daily basis. Joe has proven himself as one of those rare people who can always find a way to get it done. Lori Bachel, Ed Salonek and Gregg Labow were recognized for the extraordinary effort and long hours they sacrificed to get the new inventory and data management systems up and running. 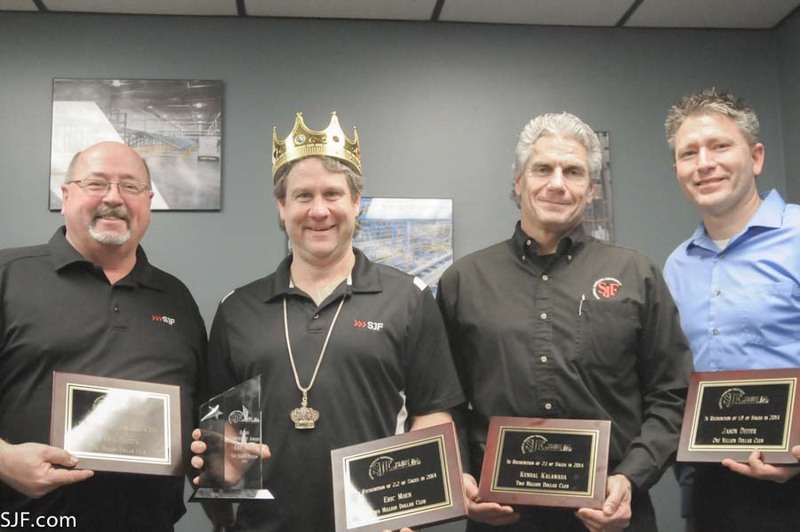 Brian Springer, Dave Kieper and Matt Johnson were also recognized for their contributions to the design, manufacture and installation of the sweep sorter project at Fun Company in Mankato, Minnesota this fall. Last but not least, special recognition was given to the entire SJF shop, dock & yard crew teams. Arguably the unsung heros of the company, the effort they put forth throughout the past year getting products picked, packaged & and shipped accurately and on time has been exceptional. Their efforts resulted in SJF receiving a record number of customer 4-& 5 star reviews from clients across the USA in 2014. For your efforts, we salute you! In the end, 2014 went down in the book as a memorable year that saw many new challenges. 2014 marked a transition from something old & comfortable to something new & bold. A year that saw individuals put aside personal differences to come together to work & succeed as a team. It was a year where everyone’s participation made a difference and has set the stage for an exciting year to come. 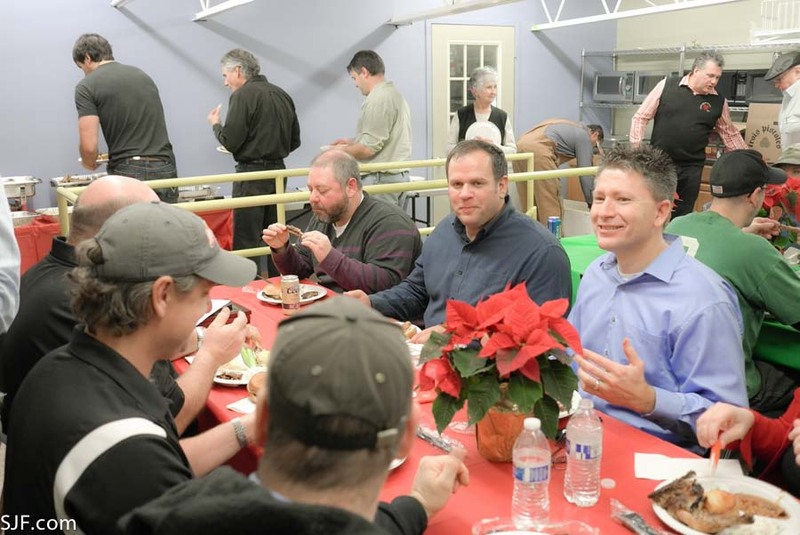 The final finishing touches today were put on SJF’s newly refurbished company lunch room. 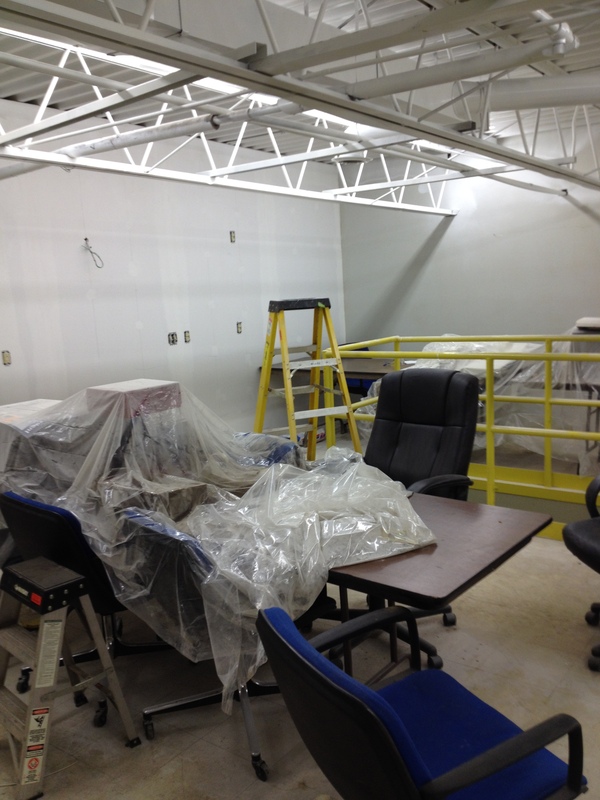 Several weeks in waiting and just in time for Christmas, the new lunch room will be completed just in time to host SJF’s annual employee chili cook-off wars. 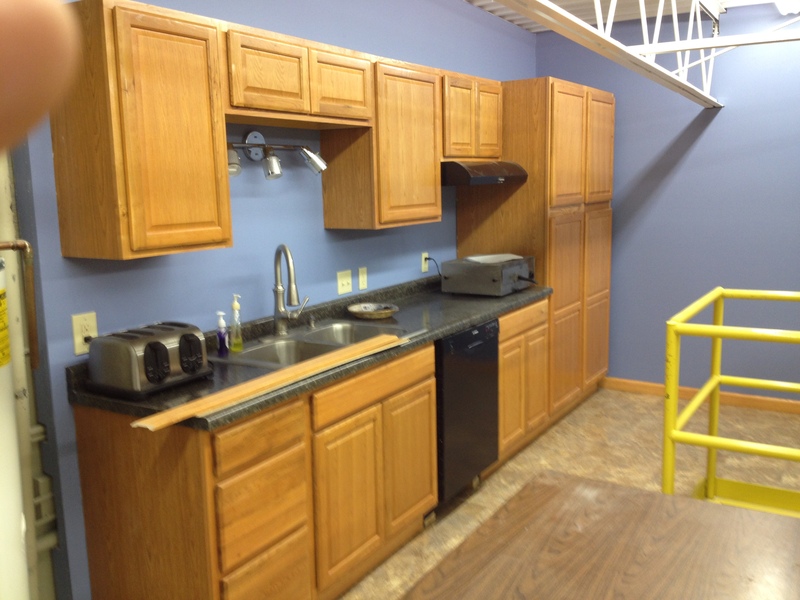 With credit card in hand, Menard’s was raided and supplies requisitioned resulting in a total kitchen makeover for the employees lunchroom. The revamp included but was by no means limited to new tiled floors, a hipster paint job, new 100% certified imitation wood cabinets, scratch & dent appliances, fully functional electrical outlets and more. All construction was done under the watchful eye of sales solutions specialist and resident celebrity “Rusty Iron Chef” Vance Haugen ( seen above in his snappy colored red shirt). Vance’s review – 2 thumbs up & a full 5 stars approval rating.